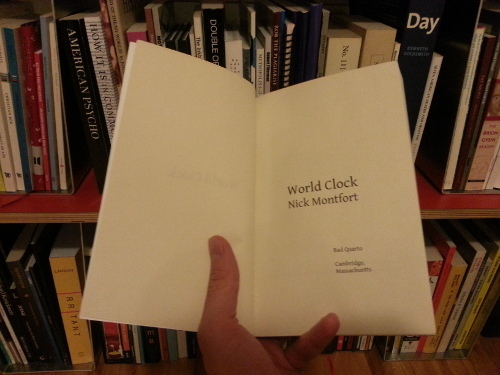 My novel World Clock, generated by 165 lines of Python code that I wrote in a few hours on November 27, 2013, is now available in print. >_World Clock_ tells of 1440 incidents that take place around the world at each minute of a day. 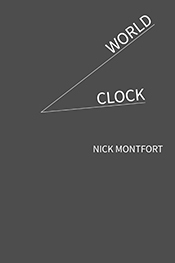 The novel was inspired by Stanislaw Lem’s “One Human Minute” and Harry Mathews’s “The Chronogram for 1998.” It celebrates the industrial concept of time and certain types of vigorous banality which are shared by all people throughout the world. The code has been online, along with a PDF of the book’s text, since late November. The Python program that generated this novel is available under a free software license. Anyone may make whatever use of it; generate your own novel with the unchanged code, if you like, or modify it to produce something different, for instance. The 239-page paperback can be purchased for only $14.40, which is the low, low price of only one cent per minute. The new project European Poetry Forum by Zuzana Husarova Martin Solotruk is now online. The project aims to connect a diverse group of poets with overlapping interests, as this statement about it explains. There are answers to queries from 38 poets up now. Just posted: **TROPE-13-03 – No Code: Null Programs** by Nick Montfort, in the Trope Report series (technical reports from my lab the Trope Tank at MIT). >To continue the productive discussion of uninscribed artworks in Craig Dworkin’s _No Medium,_ this report discusses, in detail, those computer programs that have no code, and are thus empty or null. Several specific examples that have been offered in different contexts (the demoscene, obfuscated coding, a programming challenge, etc.) are analyzed. The concept of a null program is discussed with reference to null strings and files. This limit case of computing shows that both technical and cultural means of analysis are important to a complete understanding of programs – even in the unusual case that they lack code. Please share and enjoy. And do feel free to leave a comment here if anything to add on this topic, or if you have a question about this report. I’d be glad to continue the discussion of these unusual programs. Online magazine The Claudius App, devoted to “fast poems and negative reviews,” is now in its fifth number and clad in the classic Sim-City-like skin of a burning New York City. There’s a more standard but still DOS-like directory listing, with links to much fine fare, including a translation of a Georges Perec piece and an interactive but also self-scrolling work, “Titanichat,” by Cecilia Corrigan and Ian Hatcher. It comes with a soundtrack, too. A great tribute. 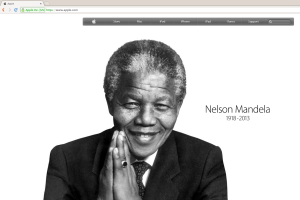 I’m sure this company wants you to feel Mandela-like while you line their coffers and lock yourself into consumption. This company would of course have you forget that the Nelson Mandela of computing would actually smash a corporate oppressor. Apple, Inc. metaphorically incarcerates mobile phone users, which is why they need to jailbreak their phones. And free speech doesn’t exist in the Apple Store, as it still does on the Internet. Apple, Inc. chooses what you are allowed to say and what computation you are allowed to do, so if you want privacy, no – on the other hand, if you want to be cured of homosexuality, you got it. Not that I object to different and even hateful opinions in a realm where free speech is allowed – but there is no such realm in this iCorporate la-la land. If you admire Mandela, why not use a system that was developed with the South African/Zimbabwean philosophy of “humanness” or “humanity towards others”? The name for this free/libre/open source operating system, developed for the betterment of people rather then concentration of wealth, comes from Nguni Bantu. It’s a distribution of GNU/Linux, Ubuntu. The next Electronic Literature Organization conference, to take place in Milwaukee on June 19-21, has just extended its deadline for submission to December 15. Media Art Show proposals and abstracts for academic talks are both welcome. A single-loading VIC-20 demo (3583 bytes) presented on November 30, 2013 at Récursion in Montréal. By Nick Montfort, Michael C. Martin, and Patsy Baudoin (nom de nom, mcmartin, baud 1). This video is of the demo running in the Trope Tank at MIT on December 3, 2013. Tagged on YouTube as Commodore VIC-20, Samuel Beckett, Electronic Literature, Computer (Musical Instrument), and Demoscene. See also the fuller story about Nanowatt with links to executable code.